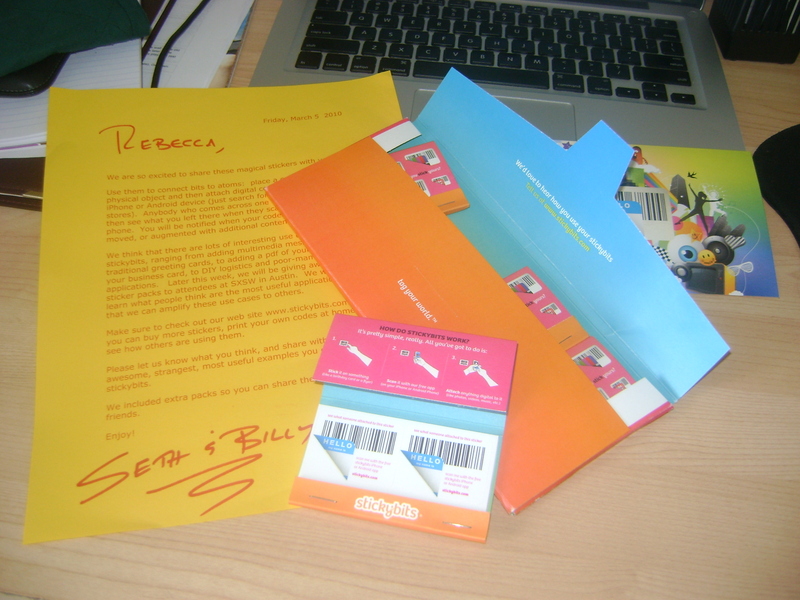 Stickybits are like little post-it notes that have barcodes on them. You scan the barcode and “attach” it to something: a website, a file, a video. Then, out in the world, someone sees your Stickybit, is intrigued, downloads the reader to their smart phone, scans your barcode, and is taken to whatever you attached to it. My inner nerd was pretty excited about this, but the wind got let out of my sails, because the app was only available for Android and IPhone, and I have a BlackBerry. Interesting, right? These things are popping up more and more, so I did some more research. Microsoft has their own Tagging Software. So, I got to thinking: you all know how I feel about posters. In a nutshell, I think they are a marketing tool that has a very low ROI, and the main reason is because there is nothing about a poster that you can take away. Will you remember the URL? Probably not. You might take a photo of it with your camera phone, or have your poster linked to a phone number you can text for more information. What if we could attach or print a bar code on posters? People could download the software, scan the code, and be taken instantly to a website where they can find out more about the play, watch a trailer, and, most importantly, buy tickets. The technology only works on some smartphones (see my example above), while others are still in development, because it’s so new. Does the technology actually work? I downloaded the reader app for the Microsoft tag and scanned it a dozen times, and it kept coming up with an error message. It never took me to wherever it was meant to. Meaning: it was a fail. There is no across-the-board reader: for each of these tagging systems, you would have to download a separate reader app. I really love this idea from a marketing perspective, but it feels to me like it still needs a lot of work before it works in the real world. Has anyone used one of these tagging systems? I’d love to hear of your successes or failures. Or if anyone is planning on putting such a system into place, I’d also love to hear about that. Interesting that you mention this, because I’ve been working on a project very similar to this concept. You can bar code anything for free and publish it. Most phones with a camera just have the ability to read these built in, or a free app to do it. I am sure your blackberry would even do it.